comedy based talk radio show and community with additional content including standup by headline and lesser known indie comedians. streaming internet radio - classic rock, folk & comedy - think, feel, laugh! the new york city online radio comedy show, written by jeffrey somogyi and dave pietrandrea. an online radio stream playing rare, obscure, funny, international, forgotten, and unusual music and comedy, 24/7. updated weekly and hosted by the ever pontificating uncle ozma. Australias most popular and dynamic annual arts festival featuring a high profile line up of cabaret, theatre, stand-up, live radio broadcasts, music, a Short Film Festival, outdoor entertainment, visual art exhibitions and a Kids Comedy Festival. adult comedy and talk radio stream. playing alternative and indie rock, plus some talk and comedy. Stand up comedy in London. Listings of comedy clubs, pubs, and information about comedians performing in the UK. Comedy entertainer, clown and comedy instructor. founder and director of the Northwest Comedifest. featuring a handful of broadcasts, from funk and dub to comedy, to rock and country. the radio ministry of the church of the subgenius. featuring rants, music, preaching, and comedy. Offering stand up comedy workshops and one year comedy programs. Located in New York City. Includes course and study details, contact information and advice for performers. fan site for bbc radio 1 announcers. photos, audio clips, guestbook, and links. featuring free-form music broadcasts, talk, comedy, and general on-air anarchy. on-demand clips of audio theater, radio drama, comedy, sci-fi, detective, horror and more, in streaming real audio g2. Tulsa, OK troupe performs shortform improv and original sketch comedy. Site contains show and ticket information. a syndicated weekly college radio show featuring new rock music, comedy, live bands, news, interviews. the show features stand-up comedy, sound bites from film & television, bloopers & out-takes, and prank phone calls. old-time and bluegrass music, features a radio comedy skit. banjo, fiddle, guitar, mandolin, and bass. bbc classic radio comedy about the adventures of a royal navy frigate. topical comedy, jokes, celebrity phone numbers, and show prep for radio personalities, writers, and anyone looking for a few laughs. updated five times a week. 'chimpage' was a student radio show, broadcasting slightly surreal comedy mixed in with the best new music. internet radio sketch comedy, from ohio universitys humor publication called 'the shaft'. a talk/comedy show where the hosts talk about anything and everything. featuring song parodies, commercials, and commentary. If the business hours of world comedy radio in may vary on holidays like Valentine’s Day, Washington’s Birthday, St. Patrick’s Day, Easter, Easter eve and Mother’s day. We display standard opening hours and price ranges in our profile site. We recommend to check out worldcomedyradio.com for further information. 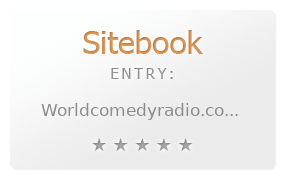 You can also search for Alternatives for worldcomedyradio.com on our Review Site Sitebook.org All trademarks are the property of their respective owners. If we should delete this entry, please send us a short E-Mail.